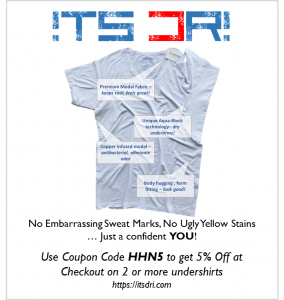 You are at:Home»Hyperhidrosis Patient Stories»I Wanted to be a HAWT Divorcee….. I Wanted to be a HAWT Divorcee….. I'm 56 years old, and I suffered from the facial/chest perspiration since my teens. A little excessive, but bearable and not so frequent. Then I had a hysterectomy at 29, and was told I would be thrust into the joys of menopause as a result. Well my temp began to rise , and more frequently, but I was sidetracked by the ridiculous facial hair. Through all this time I paid attention to my appearance, never left the house without the face and hair done. My divorce came at 39, and I thought I would eventually get back “out there”, but first I had to fight Hodgkin's for 14 months. Oddly the sweating stopped during that time, but returned with a fury about the same time my hair did! It got so bad and so frequent my hair would be drenched, make-up running down to my knee socks, shirts wringing wet. A virtual waterfall will be cascading down my face. I haven't been able to keep makeup on for 4 or 5 years now. Doc says it wouldn't be hot flashes but he offers nothing else. I was thrilled to find this site, I'm for sure finding a dermatologist and making an appt. I can't imagine doing too many more Ohio winters with the A/C on. I'll post again after I make that appt! I have had hyperhidrosis (palms and feet) since my childhood. 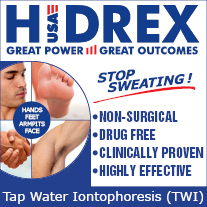 I have tried/researched almost every treatment for hyperhidrosis over last decade, and in the process have acquired considerable experience that I hope will help others suffering with hyperhidrosis. I am happy to help you in whatever way I can to manage your excessive sweat problem - see the About page for more details and my contact information. Remember you are not alone, and that hyperhidrosis is entirely manageable with informed treatment. Good luck! PS: I recently published all that I have learnt about Hyperhidrosis in my book No Sweat! I encourage you to check that out as I believe its the best resource out there to understand and manage hyperhidrosis without falling for the miracle cures. Will love to hear your feedback on how to make it better.